How do you know when the movie you’re watching is not worth your time? 1. When it’s a romantic comedy with almost no laughs, and surely fewer than can be found in a dud like Little Fockers. 2. When Jack Nicholson is totally wasted, and he gives a performance that seems to imply he knows he shouldn’t be there. 3. When Reese Witherspoon is absolutely, seriously adorable, but the film is still unwatchable. 4. 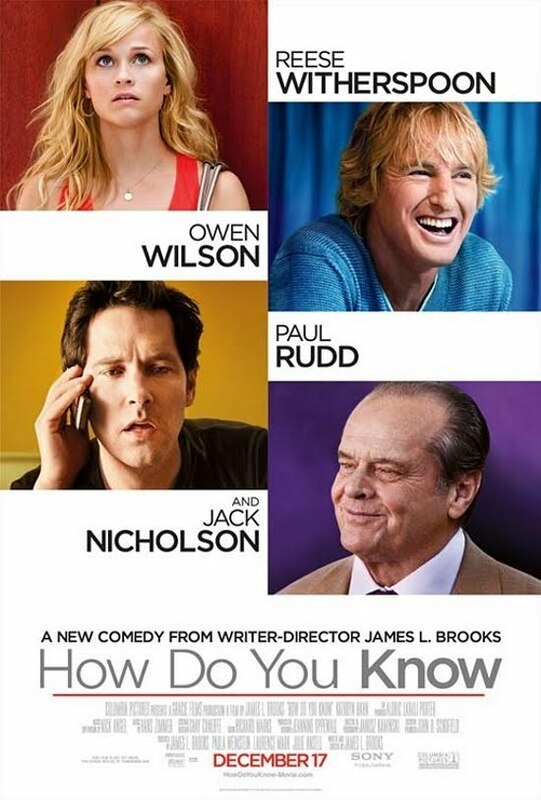 When you feel sorry for Paul Rudd, because he’s starring in his second disappointment in six months’ time. 5. When it’s a movie about a talented, popular, confident, inspiring softball player who unexplainably is cut by her team and proceeds to show no signs of confidence, making one stupid and inconsistent decision after another. 6. When you wish you’d seen it sooner, only so you could include it on your annual list of least-favorite movies. 7. When it’s a romance, but you really don’t want the leads to end up together at the end. 8. When it’s a “modern romance” that seems to know very little about modern romance — or other modern conventions, like cell phones, for example (i.e., neither of the high-powered businessfolk use a Blackberry or iPhone). 9. When it’s about 20 minutes longer than it should be. 10. When it’s called How Do You Know. I’m giving this one a D.